My seminar student, Miki Fujimura, and I have theorised, in accordance with Naclanian theory, that Westerners and Japanese expect rather different things from the games that they play, and analysed computer games accordingly. Japanese computer games have a high level of fantasy in their depiction - their visual aspect is simplified and idealised to the point of heros becoming very look-alike styliszed "characters" (in the Mario/Kitty/Kirby-esque sense of the word) but they offer interesting, branching, story paths, that resemble life (like the Game of Life, or Sugoroku created by my wife pictured above). Sugoroku is a board game like sntakes and ladders, in which one rolls a dice to see which of the paths one follows to reach a destination. It has been created and played since at least the Edo peroid, whith the boards often representing a journey or tourism experience ending at mount fuji for instance. The game above shows routes ending at our houses and the local swimming pool. Western games on the other hand, such as Call of Duty, aim for highly realistic visual depictions to the point where it almost feels like the game is visually real but simplified idealised stories where basically almost all of them consist in a battle-field where one shoots and kills a lot of enemies, and or drives fast, and that is it. That is to say the Japanese want realism in the linguistic (story) aspect of the game, but idealisation in the visuals, whereas Americans want realism in the visuals, but simplified idealisation in the story. In line with this, the area in which one can choose is also limited by their respective realism. 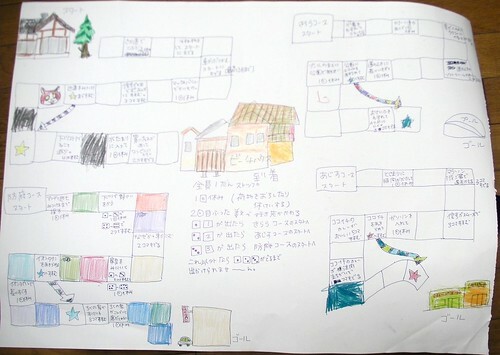 While Japanese games (like the sugoroku above) have realistic stories one often is constrained by them. In the game above there are different game paths but no choice as to which path one can take, which (like in "The Game of Life") is decided by the roll of a dice. One is however offered a wide in the visual aspect of the variety of characters that one can become. In Call of Duty, I predict that there is a wide variation in the routes one can take through the battlefield but I hypothesise that the number of people - in terms of their visual aspect - one can control is very limited. Japanese games usually also provide an objective visual perspective on the player, seen from the outside. The Japanese player becomes the "impartial spectator" or "generalised other" of the stylised visual avatar that he controls. Japanese games mirror Japanese life. Similarly the Western player becomes the linguistic impartial spectatory or generalised other of the character that he controls, as we do in life, but I am not sure in what game phenomenon that this consists. I guess it is related to the way in which Western games are often equipped with headsets using which one can talk to other players. Verbally the Western player is - like the Japanese viewpoint on Mario- out of the action, ablel to say "Oh no I have just died," but experience his own visual death with the screen going red and or blank. Japanese can watch mario drop out of the screen, while their viewpoint remains visually immortal. In addition to tourism, reviewed in the next post, this relates (Mr. Imamura) to the hopes and dreams that Japanese and Westerners have of the afterlife. Westerners (asterror management theory proves) aim for symbolic importality, to keep on talking or being talked about after they die. They want to become the fiction that they have lived. Japanese however, hope to live on in the visuals that they have created - primarily their offsprung- their grave, the picture hanging above the household buddhist altar and imagining themselves visiting and watch and protecting their family once or twice a year, at least at the festival of obon. The Japanese too want to become the fantasy that they have lived upon their death. Fame in the sense of name is far less important. Come to think of it Ms. Fujimura has pointed to a great way of understanding Japanese and Western culture since each express themslves, their selves, their ideals, so vividly in their games. Thank you Miki Fujimoto.